Xanax is a drug which is a benzodiazepine derivative. It is classified as short-acting, and is used to treat anxiety disorders and insomnia. There is now a general consensus among many psychiatrists that Xanax (a so-called 'high-potency' benzodiazepine) poses a particularly high risk for misuse, abuse and dependence. Withdrawal after long-term treatment should be done slowly over a period of weeks (or even months) to avoid serious withdrawal symptoms such as agitation, panic attacks, rebound anxiety, muscle cramps and seizures. Xanax, like all benzodiazepines, has the potential for abuse, especially in individuals prone to addiction. Although it is not manufactured illegally, it is often diverted to the black market. The state of relaxation, anxiolysis, disinhibition and euphoria induced by benzodiazepines is the main reason for their illicit use. For recreational effects, Xanax is generally administered orally. Nasal insufflation (often called "snorting") sometimes occurs, but due to the drug's chemical structure, it is not absorbed through the mucous membranes. Instead, the powdered tablets and mucous drip down the back of the throat into the stomach, where they are absorbed as they would have been if taken orally. Therefore, insufflation of the drug is no more potent than when taken orally, and it often severely irritates the nasal passages. Furthermore, nasal insufflation may be significantly less potent than other means of administrations on a dosage-per-time basis, because the mucous drip enters the stomach at a slower rate than traditional ingestion. Also, when the drug is snorted, the user often "passes out" into a deep sleep and later wakes up disoriented, having no memory of what occured prior to sleeping. Injecting alprazolam is highly dangerous. When crushed in water, it will not dissolve, potentially causing severe damage to arteries. Whilst it is somewhat solulable in alcohol, the combination of the two, particularly when injected, can easily cause a serious (and potentially fatal) overdose. 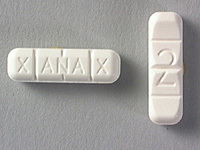 Xanax is sometimes used with other recreational drugs to relieve the panic or distress of dysphoric reactions to psychedelics such as LSD and also to promote sleep in the "come-down" period following use of recreational drugs with stimulant or insomniac properties (such as LSD, cocaine, amphetamines, DXM, and MDMA). It is also often used in conjunction with marijuana or heroin to help induce the relaxing effect. Xanax is often combined with the drug Methadone to produce a unique, Heroin-like "high". It also sometimes used by heroin addicts to suppress withdrawal symptoms. Xanax overdose symptoms include somnolence, confusion, impaired coordination, diminished reflexes, and coma. Death has been reported in association with overdoses of Xanax by itself, as it has with other benzodiazepines. In addition, fatalities have been reported in patients who have overdosed with a combination of a single benzodiazepine, including Xanax, and alcohol; alcohol levels seen in some of these patients have been lower than those usually associated with alcohol-induced fatality.